This lot was originally inspired by the famous Trojan Room Coffee Pot, which led directly to the invention of the webcam. In my case, I worked in a very long office with my desk at one end, and the chocolate machine at the other. The machine would fail on a regular basis when the cooling circuit shut down and would then refuse to dispense any chocolate, which was a pain after the long walk to get there. 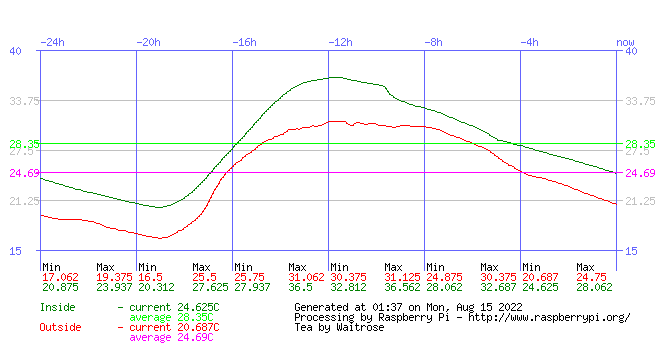 So I decided to monitor the temperature from my desktop so I could see if it was worth the walk to get there. The idea was sound, but the cable run proved prohibitive, so I ended up monitoring the temperature of my drinks mat instead. The office and chocolate maching are long gone, as is the original machine that this lot lived on. 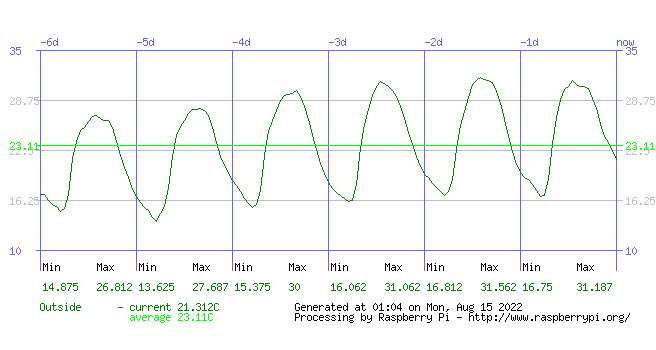 The green trace is the inside temperature, and the red trace is the outside temperature. Spikes in the green trace are because the sensor is embedded in my drink coaster. So you can tell when I have a cup of tea on the go. Samples are taken every five minutes. Samples taken every hour for the past six days. I don't really like this, so may increase the sampling frequency. Then again, I may just get on with the tea drinking instead. For the technically curious, this lot is being processed by a Raspberry Pi, running Raspbian Linux. The Dallas DS18B20 temperature sensors are connected to the GPIO headers (3V3, Gnd and data, which is on GPIO4) and read by the kernel w1_therm module. This then punts the output to a logfile which is read by a bit of Perl that converts the tabular data to a graph, and builds a .png of it before uploading it to the server. It's not perfect. For some reason every now and then the sensor returns a "doesn't respond to CONVERT_TEMP" error and a -ve temperature. This is smoothed out by checking the CRC and re-reading if necessary. Finally, I'm using the perl module Net::Twitter::Lite to let the world know every time I have a cup of tea. There is absolutely no good reason for this whatsoever, which is precisely why I did it. https://twitter.com/nronketti if you're that interested.